Robin Mark sings this lovely old Welsh hymn. If things get tough today, Lord — and in all hard times — let me stay motivated and calm. Let me look at how far I have come rather than how far I still have to go. Let me continue counting my blessings, not what I've been missing. May every day bring new chances to grow, new beautiful things to see, new plans to do, and new goals to pursue, as every new day is Your miracle day. Oh Holy God, who has taught us that we should not be yoked with unbelievers, and that righteousness has no fellowship with unrighteousness; I pray that you will send into my life people who confess the name of Jesus Christ, people who love you and follow you and seek to grow in your Spirit every day. Let me be honorable and worthy before the profane world, dear Father, but also let me find more friends of sincere convictions, that I may follow your command to be in fellowship with other saints, and thus be reinforced in the holiness and purity of Christ to which I aspire. Oh Lord Jesus Christ, who said to your apostles, “Peace I leave with you, my peace I give unto you”; I pray that I and your whole church, the body of all faithful people, will know your peace, and live in harmony and unity, one with another, in accordance with your wishes. This I pray to you, who lives and reigns forever. I recently got a message from an irate reader, stating that “there are many different paths to God.” Name a verse in the New Testament that would prove this notion false. 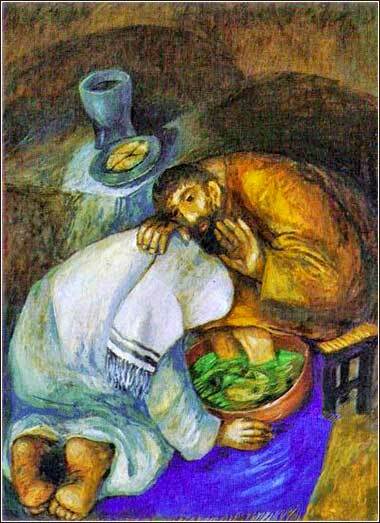 Washing of the Feet, by Sieger Koeder, ca. 1980. For I am the Lord your God . . . .
Whoever sows by the flesh will reap corruption. But whoever sows by the Spirit will harvest eternal life. So we should never lose our enthusiasm for doing good or put God to the back of our minds, because if we keep at it, we will reap our reward in good time. 9 So the good we-are-doing we must not lose-enthusiasm-for, for in time own we will harvest if not giving-out. About the Daily Prayer BibleThe “Daily Prayer Bible” is a paraphrase translation. This means accuracy to the original text has been sacrificed, to make it more readable and readily understood. This is especially useful in the Epistles of Paul. Verses are often out of order and often explanatory matter is included in the actual translation. It is part of a larger work, DP 3-Column Bible, a Bible translation with 3 different levels of literal accuracy, which you can access by clicking the link at the bottom of the Scripture section. We call the most readable and least accurate translation the “Daily Prayer Bible”. The middle translation (“The American Bible”) is what is called a “literal” translation, accurate to the original text but using English grammar and idioms. The third translation is a unique transliterative text, called “Verbatim Bible”, that has an unparalleled degree of accuracy but is not readable except with difficulty. It gives the non-Greek-reading user the ability to see the inaccuracies and ambiguities that become invisible in even the best so-called “literal” translations, such as the NASB or our own American Bible..
We harvest the bounty of Christ throughout our lives, in some senses; but today, we are going to concentrate on the great “final harvest,” the return of Christ to claim His Kingdom and the final return of all souls to dwell with God in eternity. he last words of today’s Scripture, “in good time,” is not quite accurate. If you look at the Verbatim Bible, the literal expression is “own time.” The Greek word for “own” is idios, which is recognizable as a root of such English words as “idiosyncrasy.” It indicates something that is individual or peculiar to a specific person or thing, and here, it means that the time we will reap the harvest is the time of the harvest itself. The timing is out of our control. We will reap our reward when the harvest comes. When will that be? We don’t know. In fact, Jesus Christ Himself might not know! It is a happy chance that we cite Mark 13 here, because we see that Paul’s admonition not to lose enthusiasm parallels nicely with Christ’s admonition about the last days. “Therefore stay awake — for you do not know when the master of the house will come, in the evening, or at midnight, or when the rooster crows, or in the morning — lest he come suddenly and find you asleep.” Jesus was more metaphorical about this point, where Paul is simply direct, but they are getting at the same substance. In practical terms, how easy is it for us to put God at the back of our minds? The temptation assails us every minute of every day. During the deepest moment of prayer in church, our minds try to stray. The world crowds in upon us: at work, watching television, being romantic, going to the doctor . . . we could fill a book with the list of “things that take my mind off of God”! This very problem is one of the roots of monasticism. If we want to work on our spiritual broadening, this is a good place to spend some time and energy — that is, trying to keep God at the forefront of our minds when the world becomes demanding. One strategy that many find successful is to use the natural punctuation points of our day. 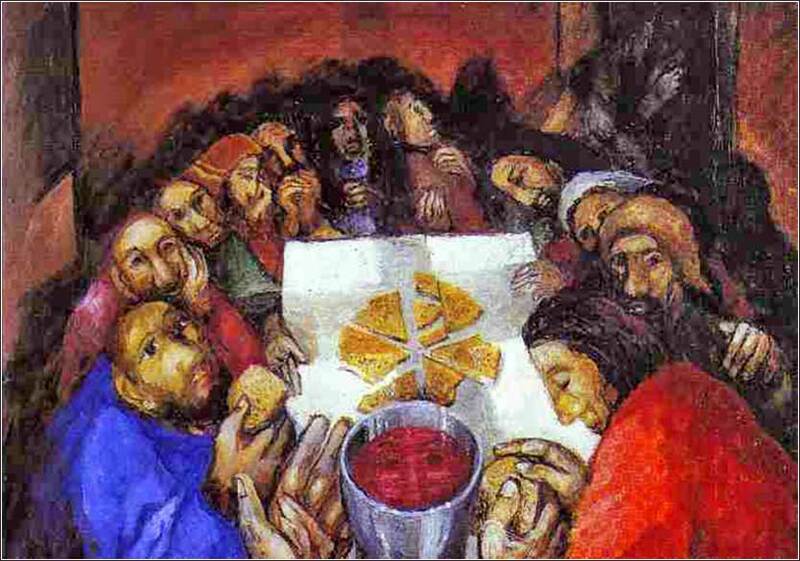 Saying grace at meals is a perfect example. Before we go to bed. When we wake up, before we get out of bed. So, here is our assignment to put today’s Scripture into action: Find a point during the day where we naturally change activities and resolve to say a short prayer, putting God into the forefront of our thought, before or after. Before is especially easy to remember. Before I hit my first drive when I play golf. Before I first turn on the television or first pick up a novel to read. When I first turn on my computer/iPad/cellphone. Every time I turn off my car in the driveway or garage. Hopefully, if we practice enough, we will remember God whenever we begin to get angry, or buy something. It is a lifelong quest to find God, at all times and in all places. Remember Christ’s commandment: Stay awake! I apologize that Saturday’s music wouldn’t play. I was out of town and my laptop went on the fritz, and there really isn’t anyone else who can fix that kind of problem. We may worry about Christianity declining, but Daily Prayer continues to grow. We are up from @ 160,000 hits per week in January, 2016, to @ 215,000 per week in January, 2017. And our Facebook page, which is primarily popular in the Philippines, is up to 500,000 users (“likes” in Facebook terms).